We would like to welcome everybody interested in research to our next Open Research day. There will be drinks and cake! Staff from RKEO and the library will be on hand to answer any enquiries you might have about Open Research. There will also be a presentation entitled What it means to be Open? with a PechaKucha by members of RKEO and the library team, where we will explain the concept of Open Access, Research Data Management, link with REF2021 and how to deposit your research through BRIAN. Researchers are also going to share why they publish Open Access at Bournemouth University. You are welcome to dip in and out, no need to stay for the full three hours!! We are now in the final stages of developing a repository solution for Bournemouth University research data. Like its partner BURO (Bournemouth University Research Online), BU’s open access research output repository that shares your BRIAN deposits with the world, the new research data repository will provide a secure yet open access place to archive and showcase all of your research data once your research projects are complete. Now we really need your help and creativity in suggesting a good name for this new Research Data Repository. 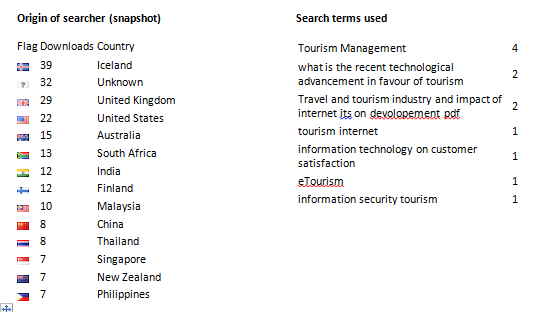 Some keywords to consider, but not exclusively, are Bournemouth University, research, data, repository and archive. Remember, the name will be something that identifies our data repository and BU’s high quality research for many years to come, so think carefully. Please note Data McDataface has already been discounted! Please email your suggestions to rdm@bournemouth.ac.uk by Friday 24th November? If your suggestion is judged to be the winning entry by the RDM Steering Group you will receive a mystery prize! You can sign up to attend a RDM workshop here. Whilst it’s relatively early to predict what Brexit will mean for Open Access in the UK, JISC recently released a blog post outlining the main issues that will arise from the UK’s decision to leave the EU. The blog post raises issues around the future of EU OA policy and also funding. At the present time, it appears the main effect of Brexit will be to create greater reliance on Green OA (usually accepted, peer-reviewed versions of outputs) rather than gold paid open access owing to fluctuating financial markets and uncertainty surrounding future European funding. Library and Learning Support have recently created a OA support video, looking at the benefits of OA and how you can make your research OA through engaging with BRIAN and BURO. Please contact the BURO team with any queries you may have and we will be happy to help. Thinking about the next REF? HEFCE’s policy for open access states that all new peer-reviewed journal articles and papers from published conference proceedings (with ISSN) should be deposited in our institutional repository BURO (through BRIAN), in full text form. Full compliance with this policy is now crucial, as HEFCE’s requirements for the next REF include the condition that outputs can only be submitted to the REF if they are published as open access at the point of acceptance. All researchers need to follow these three steps, to ensure that all your articles can be considered for the next REF. Keep this version for journal articles and conference proceedings (with an ISSN). This is not necessary for books, chapters or other output types. When your publisher sends you an acceptance notification, log into BRIAN to add the basic publication details and upload the document. Email openaccess@bournemouth.ac.uk or BURO@bournemouth.ac.uk with any queries or questions. You can also visit the Library guidance page on Open Access and Depositing your Research. All researchers must follow this for their work to be considered for the REF, in line with the HEFCE’s policy for open access. A comprehensive list of FAQs on the policy is available. No booking is necessary, just turn up! 1 Authors’ Accepted Manuscript – this is the final peer-reviewed manuscript, before the proof reading starts for the published version. It is often a Word document, publisher template, LaTeX file or PDF. 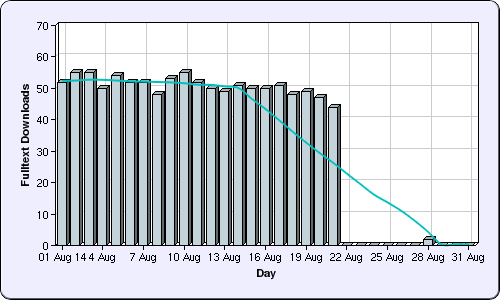 2 This is when the publisher confirms to you that your article has been accepted. BURO, BU’s open access repository for research, is currently experiencing some intermittent Distributed Denial of Service (DDoS) attacks, which means that occasionally it has been temporarily unavailable to our BURO Editorial Team and external users of open access content. Please note, this does not seem to have affected the uploading files to BURO from BRIAN or the links to open access works embedded in your Staff Profile Pages. The company that host BURO have been contacted and we hope all will be resolved shortly. If you have any concerns please report to IT Services. The guide Open Access and Depositing your Research will help answer some of your questions about open access. For 2015/16 Academic Appraisals the appraisee will need to complete the Academic Staff Performance Appraisal Form (ASPAF), Section B (Academic Staff Profile) includes a review of outputs and BURO. The following guide will help you extract that information from BRIAN / BURO to be able to take it to the meeting. 26% of all research outputs added to BRIAN are now available in full text in BURO. 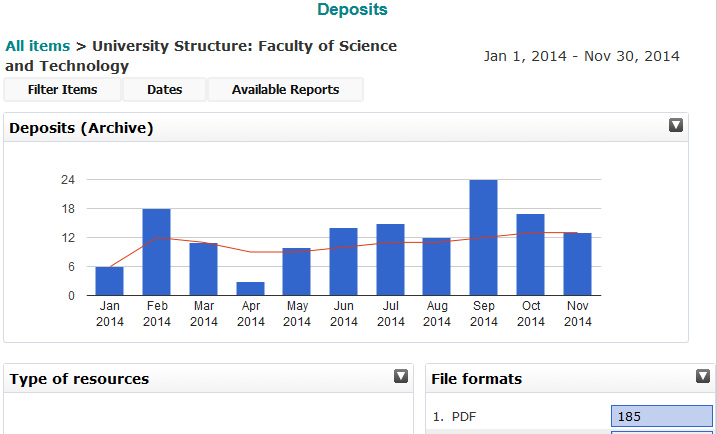 This marks a big increase in the number of academic staff uploading full text when they add their metadata to BRIAN. 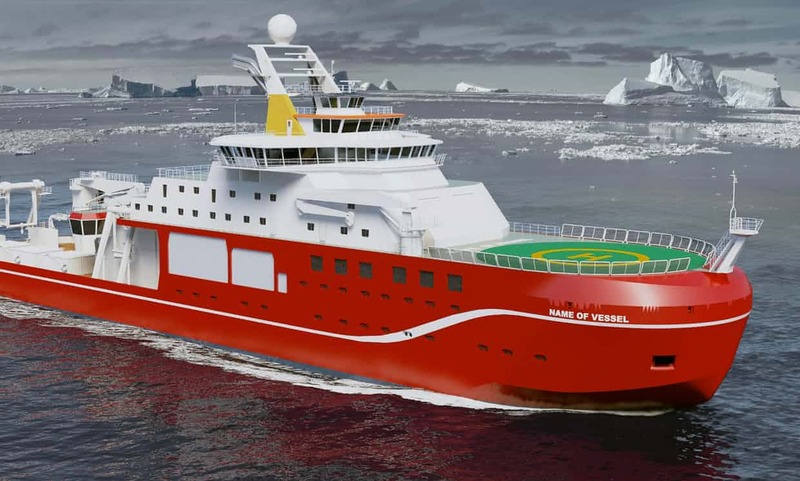 This is very encouraging as we move towards full compliance with the REF in April 2016. 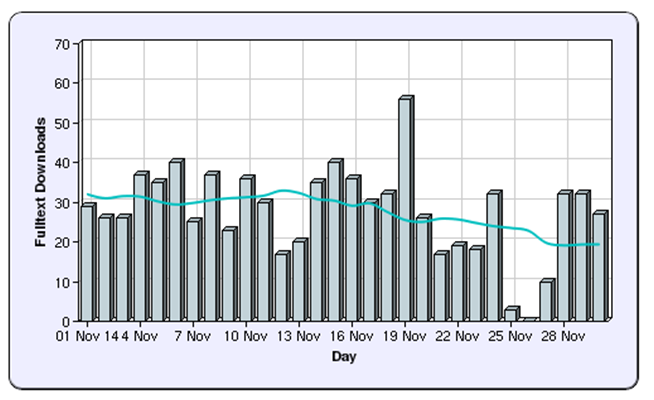 Increase in full text downloads from BURO from October 2013-November 2014. Patton, D., 2013. Realizing Potential: The Impact of Business Incubation upon the Absorptive Capacity of New Technology Based Firms. International Small Business Journal, 32 (8), pp. 897-917. Please do keep adding your full-text research outputs to BURO via BRIAN, both green and gold. To be eligible for submission to the next REF exercise all journal papers and conference proceedings will have to be made freely available in an institutional or subject repository (such as BURO) upon acceptance (subject to publisher’s embargo periods). See the blog post here on how to add outputs to BRIAN. 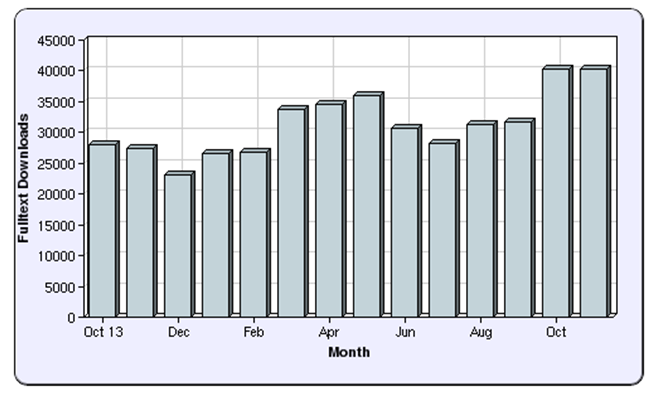 We use IR Stats software to analyse your research outputs in BURO (Bournemouth University’s institutional repository) and produce the statistics below. A dashboard of statistics on individual outputs is freely available to all – simply access each of your items in BURO and scroll down the web page. This article is a green open access post print i.e. the author accepted version. Always remember to retain this final peer-reviewed version of all your research papers. Most articles in BURO are author accepted versions. You can check publisher copyright policies for archiving in BURO on the Sherpa Romeo website. This demonstrates how well BURO is indexed by the most high profile search engines for research. 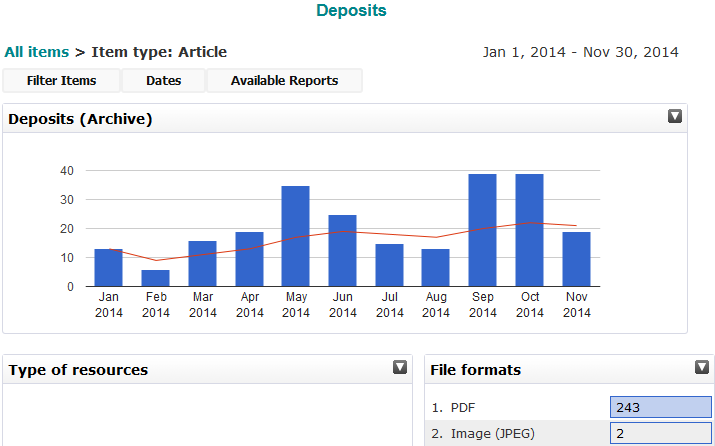 Gold open access articles are added to BURO alongside green author accepted versions. BU have a dedicated Open Access Publication Fund to support the publication of articles in open access journals and in complying with some of the major funding bodies. Find more information on green and gold open access and the new HEFCE policy for the next REF here. 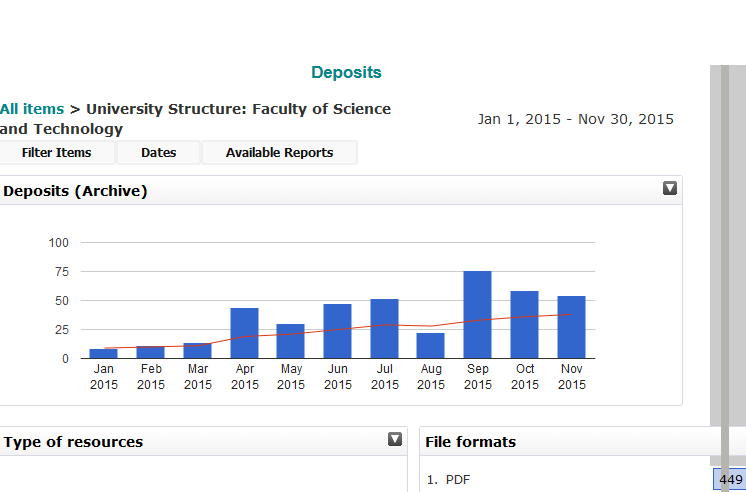 PhDs consistently appear high up in the most downloaded outputs lists in repositories and BURO is no exception. In August these theses were 2nd 3rd and 4th in the list. BU has a number of internal systems that enable research activity and outputs. To find out what the systems are, what they do and how they interact with each other, visit the ‘BU Research Related Systems’ page, which can be found under ‘Research Toolkit’. 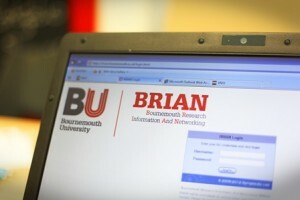 BRIAN (Bournemouth Research Information And Networking) – BU’s publication management system and how it’s linked to the BU staff profile pages. If you have any problems accessing the system or you have any queries please contact BRIAN@bournemouth.ac.uk and the BRIAN team will be happy to help. BURO (Bournemouth University Research Online) – BU’s institutional repository. If you require help assessing whether an open access version of your work can be contributed to BURO please contact your Subject Library Team or SAS-BURO@bournemouth.ac.uk. 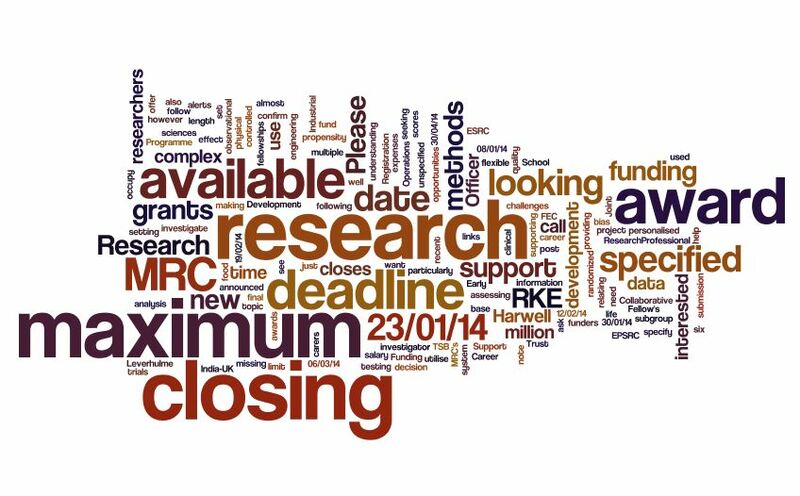 RED (Research and Enterprise Database) – this is a record of all the research and knowledge exchange activity which takes place at BU. If you have any problems accessing the system or you have any queries please contact the R&KE Office . Please note that Shelly Maskell is the new Research Outputs development officer within R&KEO and as part of this role, Shelly now manages BRIAN. Use the new SHERPA/FACT tool to help you check if a journal’s open access policies complies with the requirements of the open access policies of the research funders that comprise Research Councils UK (RCUK) and the Wellcome Trust. The data on journal policies is drawn from SHERPA/RoMEO and the funders’ policies from SHERPA/JULIET. The more established SHERPA Romeo website provides details of publisher copyright and archiving policies. This tool will help you establish whether you can deposit your open access research papers in BURO (BU’s institutional repository), via BRIAN for free. Contact the BURO Editorial Team or your Library Subject Team for more help and advice around making your research open access in BURO. Celebrate International Open Access Week – the GREEN route! 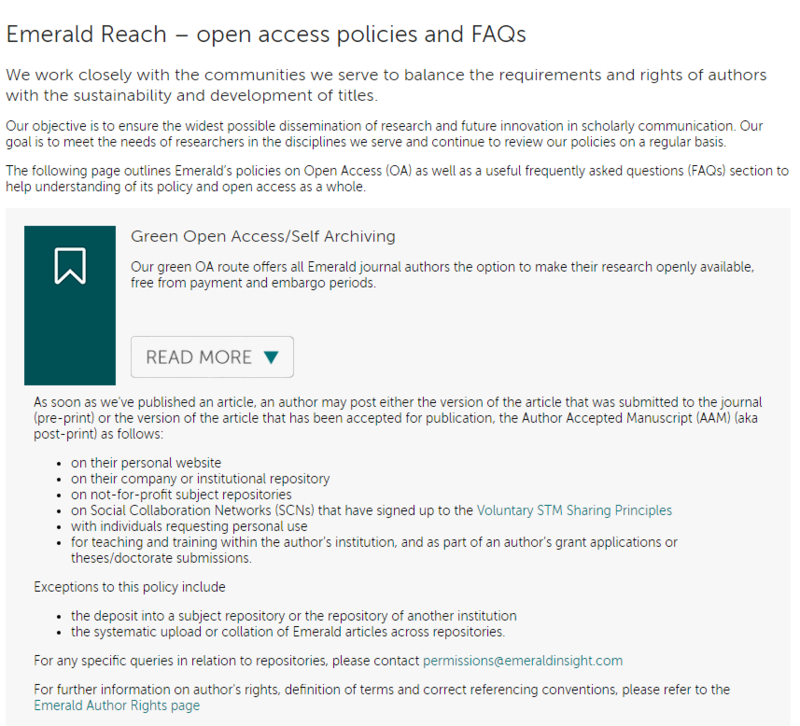 The green route to open access is where a version of the paper is self-archived in a repository, such as our institutional repository BURO. This process relies on researchers uploading their own papers. Repositories offer a number of benefits. They increase the availability of some published journal works with restrictions on reprinting or text mining, and may enable work to be propogated across the internet and used for novel applications. 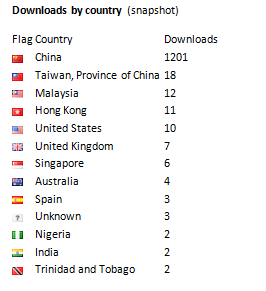 Repositories also allow authors to keep track of who is downloading their data. 1. Log into your account and find the paper. 2. One of the tabs is ‘full text’. 4. Click on this and you will see the archiving policy for this particular journal, clearly stating which version of the paper can be uploaded. 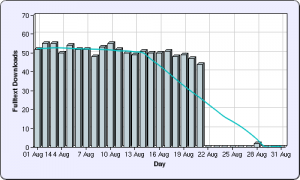 Open access publishing – common minsunderstandings! Reflecting on the experience of our recent mock REF exercise I noted that there were some negative views towards open access publishing that were expressed during the process. This is a little concerning considering the UK government is planning to make all outputs arising from publicly-funded research available via open access outlets by 2014 and considering the open access mandates the major research funders have as part of the terms of their grant funding (including the research councils, the Wellcome Trust and the European Commission). In addition, the four UK funding councils are currently consulting with the sector regarding their proposal to introduce a requirement for all outputs submitted to the post-2014 REF exercise to be published on an open access basis, wherever the concept of open access is relevant. As an institution and as individual researchers we need to ensure that we are able to comply with these requirements and that we are able to positively embrace open access publishing. I did a bit of research and came across an excellent article by Peter Suber, Director of the Harvard Open Access Project. In the article, Peter addresses the common misunderstandings and misconceptions about open access publishing, many of which we part of the concerns raised during the recent mock REF exercises. I’ve selected the ones I most frequently hear and provided a summary below, and would urge you to read the article in full here – A Field Guide to Misunderstandings About Open Access. 1. “All open access is gold open access” – not at all! Gold open access refers to open access through journals and green open access is via repositories. Suber notes that researchers often overlook the existence of green open access or think they will not be permitted by their publisher to deposit a copy of their paper in an open source repository. At BU we have our own institutional repository, BURO, and BU researchers can add the full-text version of their papers via BRIAN. Suber notes that between 50-70+% of journal publishers give permission for postprint achiving in repositories. BRIAN will check the copyright of the publisher for you and let you know which version of your paper can be added to BURO. Easy peasy! 2. “Open access is about bypassing peer review” – not true! The goal of open access is to remove access barriers, not quality filters. Open access journals can, and usually do, use the same peer review processes, the same standards, and even the same reviewers as traditional print journals. Many traditional print journals offer an open access route as part of publishing in their journal (hybrid publishing). 3. “Authors must choose between prestigious publication and open access” – incorrect! There are two reasons why open access is compatible with prestige: a gold reason and a green one. First, a growing number of open access journals have already earned high levels of prestige, and others are earning it. Do your part to move things along as an editor, referee, reader, and as an author, by submitting your best work to suitable open access journals. In the meantime consider the second reason. Most traditional print journals allow open access archiving, such as in an institutional repository. 4. “Open access makes sense for second-rate work, but not for first-rate work” – again, not true! The idea behind this misunderstanding is this: the best work generally winds up in the best journals, where it has the best chance of being seen. At least it should be steered toward the best journals, where it will have the best chance of being seen. When we add the suggestion that this path doesn’t allow open access, or that open access can’t improve upon it, then an idea that was largely true becomes completely false. It assumes that the best journals are never open access (not true – Nature, Science and IEEE for example all offer open access options); that only journals can deliver open access (not true – green open access); that the best journals never allow open access archiving (not true – see SherpaRomeo, Science for example permits achiving of post-print of the publisher’s PDF); and that open access archiving can’t increase the visibility and impact of work published in the best journals (not true). Suber notes 20 other common misunderstandings about open access and his article is well worth reading! At Bournemouth University we are committed to supporting the open access movement and have been running the BU Open Access Publishing Fund for two years now and will continue into 2013-14. For information on accessing the Fund please visit this page – BU OAPF. 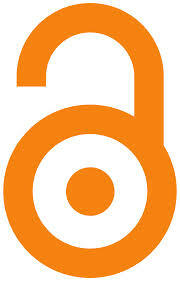 We’re interested to hear your thoughts on open access publishing! Have you tried it, are your sceptical, are you a supporter? Full Text Articles should be uploaded through BRIAN to comply with Bournemouth University Academic Publications Policy on Open Access. As most publishers allow the Accepted Version of journal articles to be made available this is the version we recommend authors deposit via BRIAN. The Accepted Version is the author-created final version that incorporates referee comments and is accepted for publication. It should not have the publisher’s typesetting or logo applied. Supplementary files of various file formats can also be deposited as files or as zipped folders. A listing of publishers, their journals and policy on archiving in BURO is provided by theSHERPA/RoMEO project; see http://www.sherpa.ac.uk/romeo.php. BURO staff will liaise with the copyright holder regarding the inclusion of full text for other publication types. When in BRIAN, click on ‘my publications’ to see your full list of publications. Each record will show a summary screen and below the title of each record you will see a set of six tabs. Click on the ‘Full text’ tab (the second tab from the right). Click on the link ‘Manage full text’ where it says ‘Manage full text for this publication’. The File management box will open. Browse and select the file(s) you wish to deposit. Click on Upload’. As indicated above, please include your final version in the first instance. Books are rarely allowed, although some publishers will permit the use of a sample chapter. BURO staff can liaise with the publishers on your behalf to check permissions. Click on ‘Grant’ to confirm you are depositing the file(s) for possible dissemination via BURO. This process does not transfer copyright to BURO. When you have deposited the files you wish to transfer to BURO click on ‘Home’ in the top left hand corner of the screen to return to your BRIAN profile home page. If you have any queries about BRIAN, please contact BRIAN@bournemouth.ac.uk/. If you require help assessing whether an open access version of your work can be contributed to BURO please contact your Subject Library Team or SAS-BURO@bournemouth.ac.uk. Clarification is required of what BRIAN is and what BURO now does. Bournemouth University Research Online [BURO] is the University’s Institutional Repository. BURO is supported by Eprints software. It gives access to academic outputs created by Bournemouth University staff and researchers. Where available BURO contains open access full text of unpublished works (pre-prints) and the author’s version of published works (post-prints). BURO is located at http://eprints.bournemouth.ac.uk – it has a well-designed interface and is easy to use. BURO is open to anyone to search, however, only Bournemouth University staff and researchers can contribute material. Material is contributed to BURO via BRIAN. 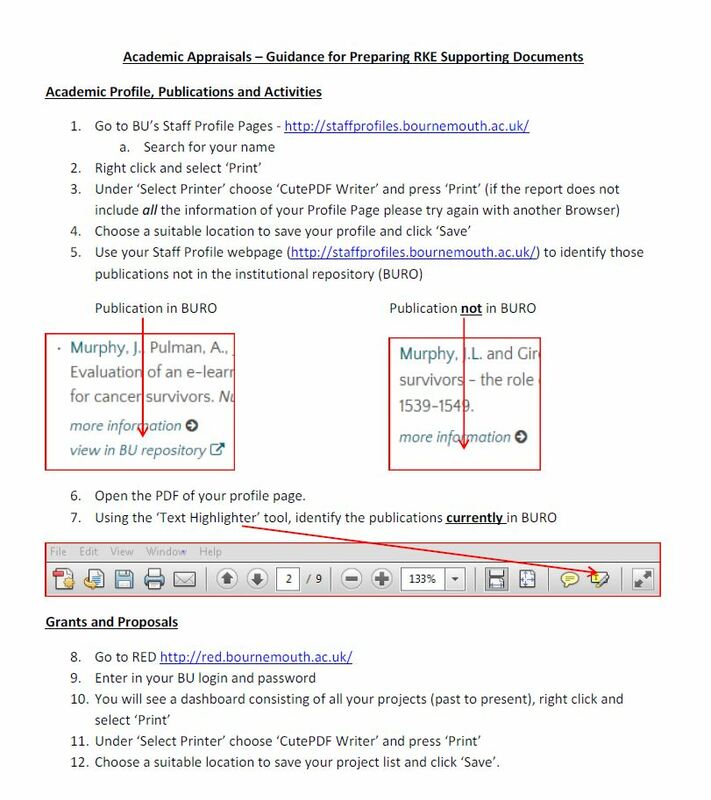 BURO contains records of outputs with full-text attached – a full list of outputs can be viewed in the BU staff profile web pages http://staffprofiles.bournemouth.ac.uk/. If you require help assessing whether an open access version of your work can be contributed to BURO please contact your Subject Library Team or SAS-BURO@bournemouth.ac.uk . I will shortly be updating the FAQ’s for BRIAN and so watch this space. 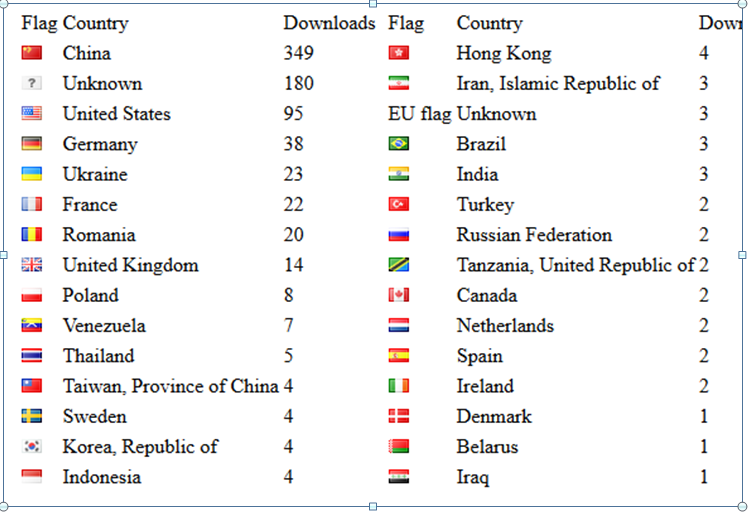 BURO Stats – who’s downloading your open access research? What’s your impact? 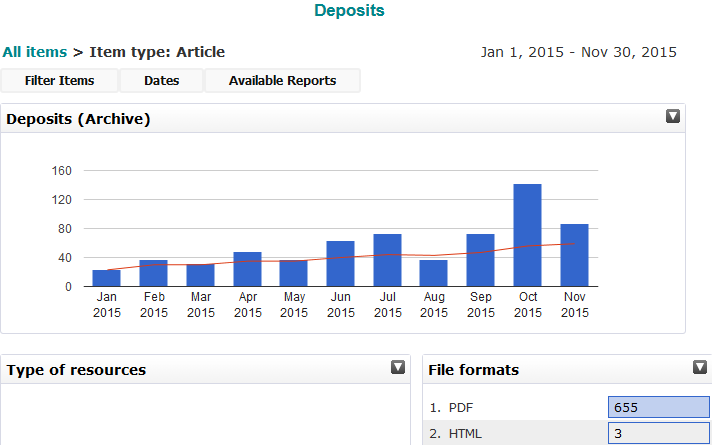 Did you know that you can access statistics for your open access research outputs in BURO? Remember – to add your full text items to BURO you need to submit them via BRIAN. All full text articles in BURO can now be accessed via BRIAN. You can view these via the ‘Full Text’ tab within your BRIAN publications screen. Where there is a full text article for a publication, a number will appear on the tab, i.e. ‘Full Text (1)’. In order to comply with BU’s Academic Publications Policy on Open Access, academics are responsible for uploading their research outputs, including full text articles. See page 5 of BRIAN – Quick Start Guide v1 to see how to deposit full text articles into BURO via BRIAN. For further information on the publications policy, please contact the BURO staff.